Pupils have recently spent some time looking the the work from Sir John "Kyffin" Williams . 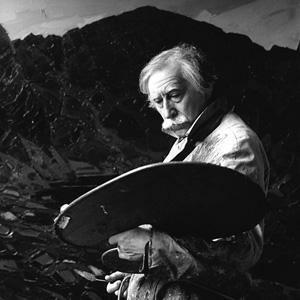 Sir John "Kyffin" Williams was a Welsh landscape painter who lived at Pwllfanogl, Llanfairpwll on the Island of Anglesey. Williams is widely regarded as the defining artist of Wales during the 20th century. His works typically drew inspiration from the Welsh landscape and farmlands. His works appear in many galleries all over Britain and is on permanent exhibition in Oriel Ynys Mon Anglesey. This was a perfect artist for pupils to look at and linked nicely into our topic on ‘Mountains’. Pupils studied a variety of images on Snowdon and then produced their own interpretation using card and paint. They worked with a very limited pallet similar to that of Kyffin. This work later developed into a large stretch of mountains from both classes and is now being shown in the entrance area to year five. Check out the photo’s below to see how we got on.